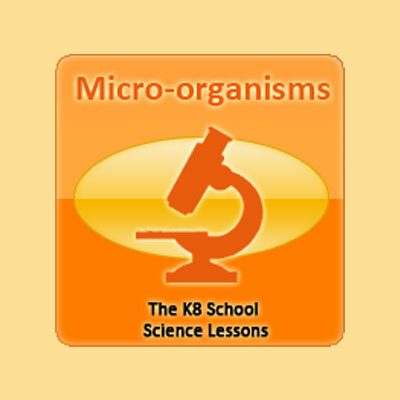 The lesson below, friction for kids, teaches about the science behind the force of friction. 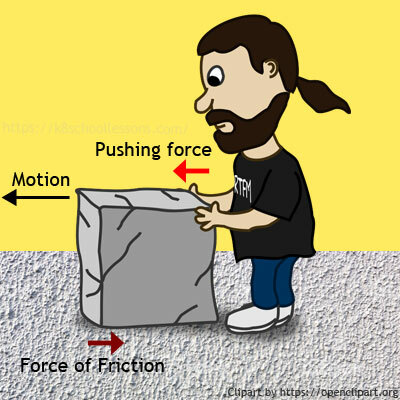 Friction is the force produced between two surfaces when they are rubbing or sliding against each other. Let’s learn more about this now, with Friction for Kids. The force of friction always works in the opposite direction to the movement. 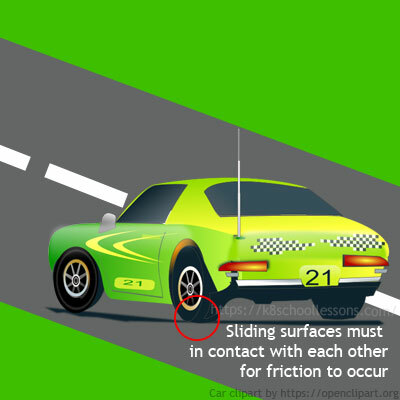 So, friction occurs when two surfaces stick to each other a little. Friction always slows a moving object down, because it tries to stop the surfaces from sliding over one another. The surface of the wheels sticks to the road, when car wheels roll along the ground. 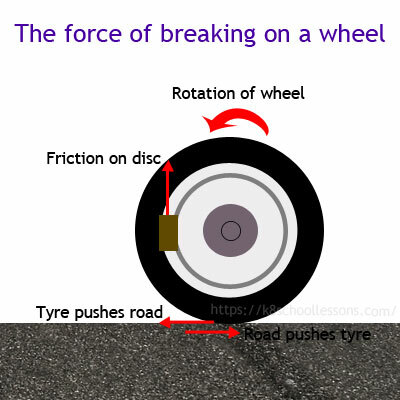 The force of friction acts between the surface of the wheels and the surface of the road and slows the car down. You might have noticed that it is difficult to push a box along a cement floor. 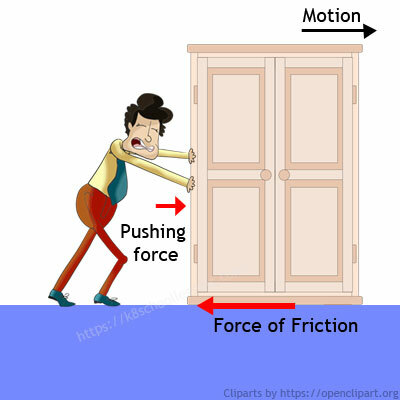 This is because; friction acts between the surface of the box and the surface of the floor and makes it difficult to push the box along the floor. 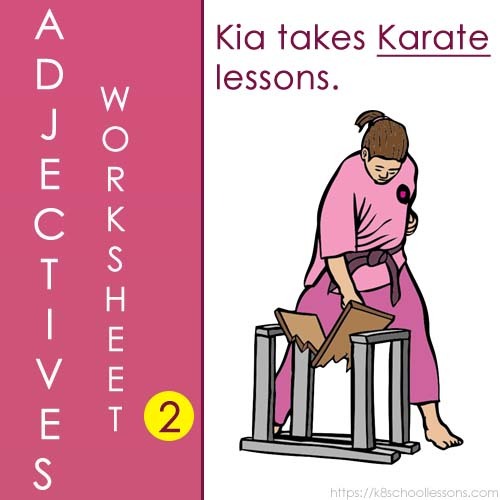 Let’s now see how more and less friction apply in our daily life, with Friction for Kids. Where do you think, you can walk easily? On a rough surface or a smooth surface? If you are unsure about your answer, let’s ask the question in a different way. 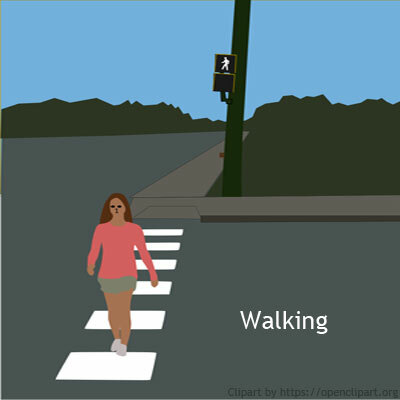 Where do you think you can walk easily? On the road or on ice? The answer will obviously be on the road. 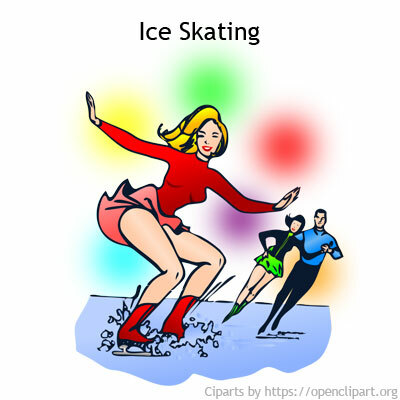 Now if you think about these two surfaces; the surface of the road is rough whereas the surface of ice is smooth. When the surfaces that are touching each other are rough, more friction is produced. When the surfaces that are touching each other are smooth, less friction is produced. 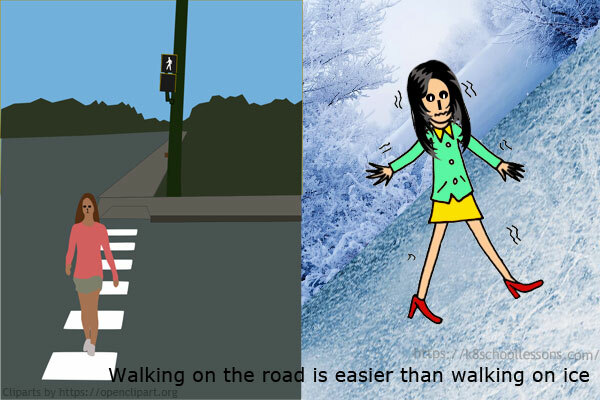 This is why walking on the road is easier than walking on ice. The rougher the surface, the more friction is produced. The smoother the surface, the less friction is produced. Therefore, more or less friction depends on the materials from which the two surfaces are made. Of the two tasks mentioned below, what is difficult to do? Sliding along an unpolished cement floor in your socks or sliding along a tile floor in your socks. You would have definitely experienced this! There’s no way you could easily slide along an unpolished cement floor in your socks, but you could easily do this on a tile floor. The smoother the floor, the faster you can slide. 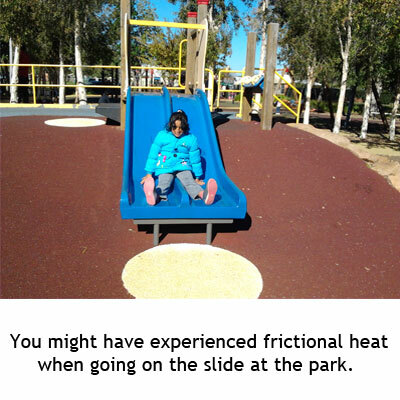 It is really hard to slide on a very rough surface. How can you walk on some highly polished surfaces which seem to have less or no friction and perfectly smooth? If you look at these highly polished surfaces with a microscope, you can see that even they have rough edges. The rubbing of these rough edges causes friction making you walk on the smooth surfaces. Both more friction and less friction can be useful. How can more friction be useful? You couldn’t walk without friction. Friction prevents the soles of your shoes from slipping over the ground. How is it possible to write with a pencil? 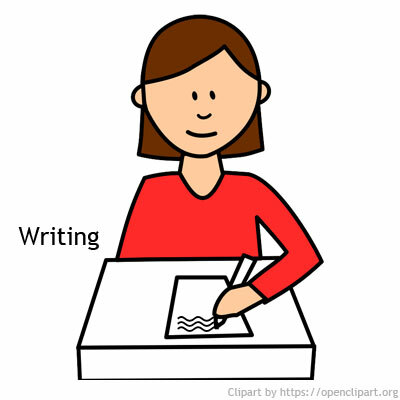 When you write with a pencil, friction rubs millions of carbon atoms off the end of the pencil, leaving the black mark on the paper. If you do a sport like climbing, it’s often useful to make friction as large as possible. 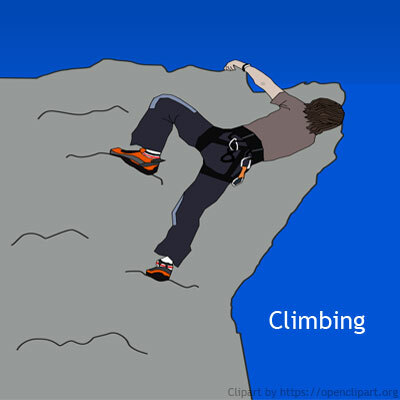 That’s why climbers use rubber soled boots for a better grip as they produce more friction. Driving a motor car or riding a bike would be impossible without friction. Brakes work by friction too. 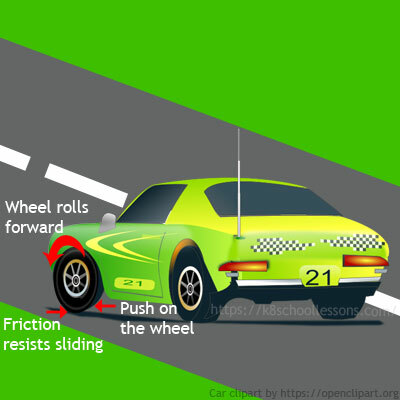 Next the lesson, Friction for Kids, shows you how brakes work by friction. Remember the brake blocks on your bicycle? You need these to slow the bicycle down when riding. To do this bicycle brakes use friction. The rubber pads press against the wheel rims and cause friction that stops the wheels from going round. Similarly, there is a set of brake pads on each of the car’s wheels. The brake pads press on metal discs fitted behind the wheels, when the driver presses on the brake pedal. This produces friction between the pads and the discs, making the wheels slow down. Imagine walking on a slab of ice! 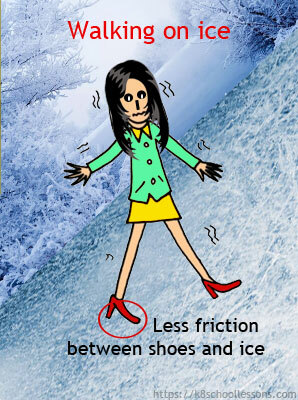 It is really hard as there is less friction between your shoes and the slab of ice. So, definitely you need extra care when walking on slippery surfaces. Similarly, driving becomes dangerous, if the friction between the tyres and the road is reduced. 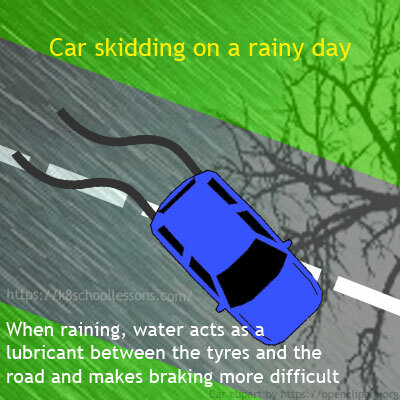 Driving on wet and icy roads needs extra care as water or ice acts as a lubricant between the tyres and the road and makes braking more difficult. Have you ever noticed the carved patterns underneath your shoes? Why are soles of shoes designed with these carved patterns? We call these carved patterns underneath your shoes treads. Treads help you walk without slipping or sliding. Treads make the bottom of the shoes rougher, so that friction acts to grip the ground preventing you slipping or sliding. 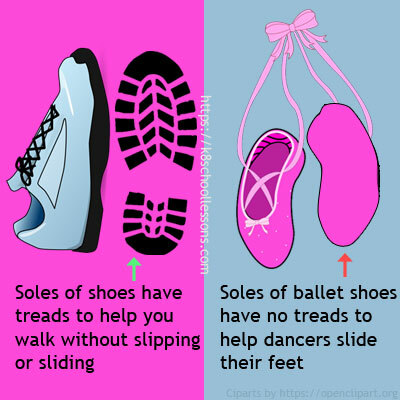 Ballet dancers need to slide their feet a lot. This is why ballet shoes don’t have treads. Tyres of the wheels have treads too. 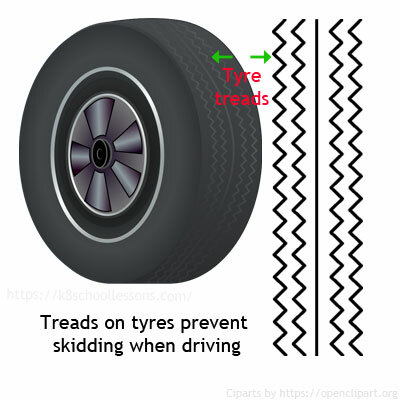 Treads on tyres prevent skidding when driving. Vehicles like tractors have tyres with deep treads because they have to drive through muddy fields. This is why tractor wheels are large and their tyres are rough in order to give them extra grip in the mud. 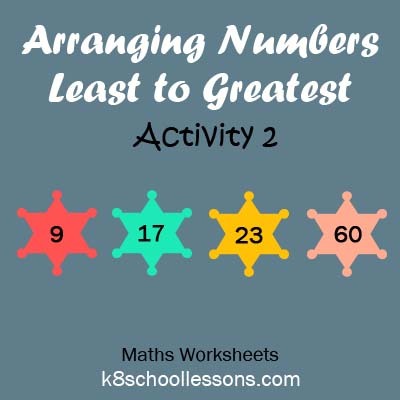 But an ordinary car tyre would get stuck in the mud, or spin round without gripping the ground as its wheels are not large and the tyres have no deep treads. The deeper the treads, the more they stick to the ground. These are a few examples of the uses of more friction. It is illegal to drive a car with a tyre tread less than 1.6 mm deep. The pattern of grooves on a tyre is designed to let water escapes from underneath it. How would you feel when you rub your hands together faster? If you have not done it yet, here’s the chance! Rub your hands together faster and see how you would feel. Yes, you definitely feel your hands get warmer. This is because of the heat energy produced by friction. We call this frictional heat. Frictional heat is sometimes a good thing. When your hands are cold, you can rub them together and make them warm. The friction between moving parts can create too much heat in machinery. This causes the parts to wear out quickly. Also, in some cases it could start a fire. 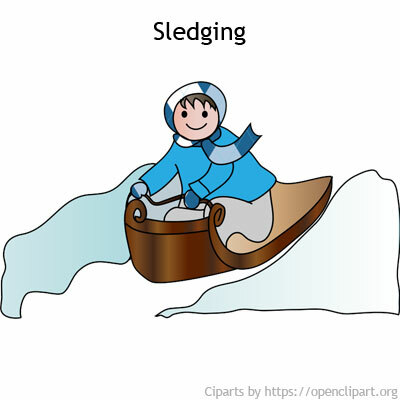 This is an example of problems caused by friction. How can less friction be useful? So, what is the solution to reduce the friction on moving parts of machines? As you know, when the moving parts of machines rub on each other, they are worn away quickly by friction. The machine is slowed down too. 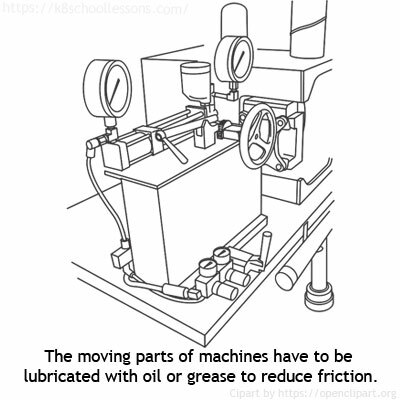 As a solution, machines have to be lubricated with oil or grease. Lubricating cuts down friction. A well-oiled machine runs more smoothly, and lasts longer. This is why oil is put in a car engine to reduce the amount of friction between the moving parts. Also, wheels are often used to cut down friction. 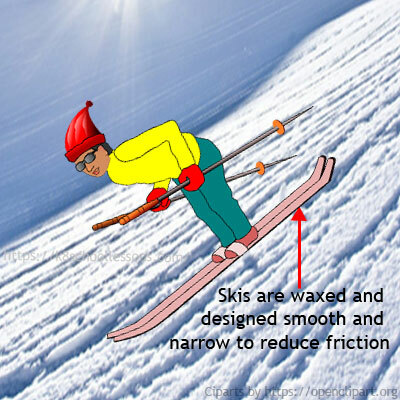 Skiers wax their skis to cut down friction. Also, skis are designed smooth and narrow to reduce friction. This allows skiers to slide easily across the snow. 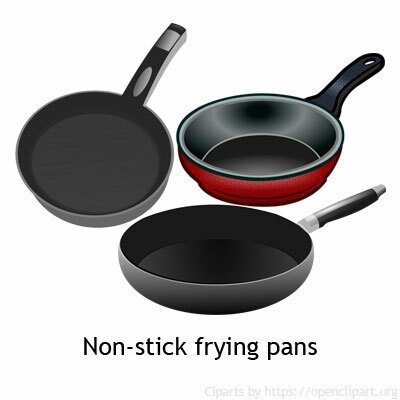 Teflon, which is used to coat non-stick frying pans, produces less friction than any other solid. A space rocket can keep flying at a steady speed with its engines off. This is because there is no friction in space to slow it down. The rockets speed can gradually change since they are affected by the pull of gravity from the nearest planet. 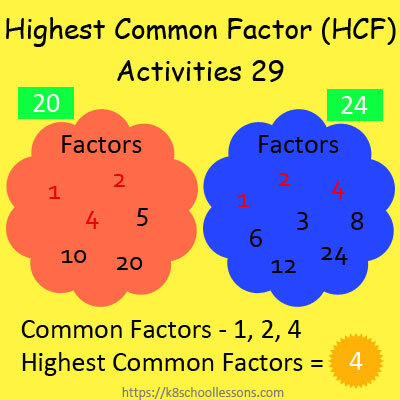 Hope you’ve learned a great deal of facts about friction by reading this lesson, Friction for Kids.